HAND MADE IN SMALL BATCHES. Our preserves are hand made in small batches from locally sourced ingredients that capture the seasons. Good food preserved with less sugar, and ready for you to share with your family and friends. Slightly sweet, a bit smokey, a hint of spice, and lots of flavour. Makes a grilled cheese gourmet, excellent with scrambled eggs and toast, or as the centre of a meat and cheese platter - our tomato jam will add flare to your plate! 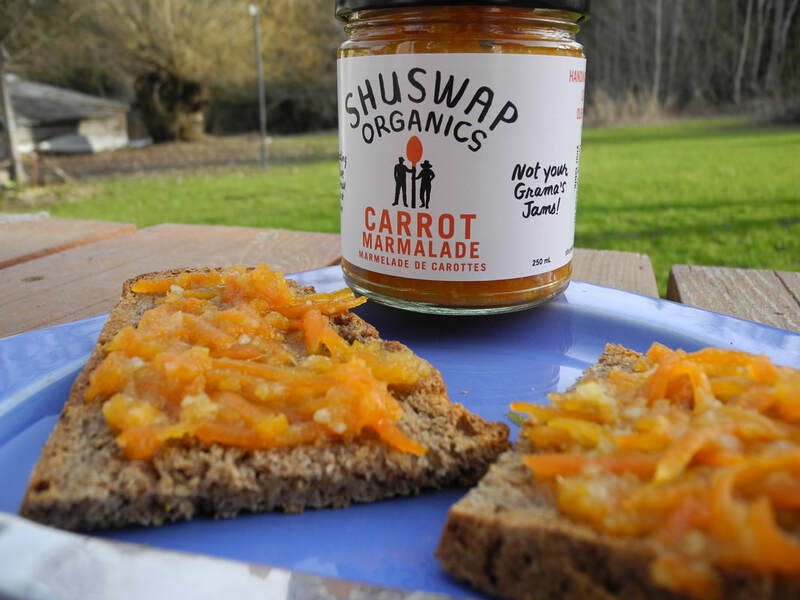 A twist on the classic marmalade, this one has carrots alongside orange and lemon. Not too sweet, this is amazing on fresh biscuits or toast. A tangy relish with a little bit of heat, and a vibrant pink colour. Fantastic on a burger or smokie at the first BBQ's of the season. Beer lover? You'll love the hoppy combination of local ale and rhubarb - true harbingers of summer! Enjoy straight out of the jar or makes any toast, biscuit or cheesy sandwich much more sophisticated. Owen and Emily are the crafty brains behind Shuswap Organics. They work together to bring you a delicious line of jams and preserves. You'll find Emily experimenting in the kitchen and out farming the fields, and you'll find Owen expertly taste-testing new recipes, and selling at farmers markets and stores across the region. They moved to the North Okanagan from Vancouver to farm, and along the way started making jams and pickles to preserve the seasons' bounty. We stand for local, artisan, organic and made-with-care. We grow as much of our ingredients as we can on our organic farm. When we need more than we grow we work directly with local farms, and thoughtfully selected suppliers.